(AUSTIN, Texas – August 16, 2018) An offer like this comes around only once every 100 years! The last chance for Texans to order a limited edition 100th Anniversary Texas license plate from the Texas Department of Motor Vehicles (TxDMV) is Friday, Aug. 31, 2018. Don’t miss this unique opportunity to celebrate license plates in Texas on your vehicle. The State of Texas began issuing a standardized license plate design in 1917. To mark the 100th anniversary, TxDMV introduced a special 100 Year Plate on Sept. 1, 2017. Texans who want to show their state pride by displaying this plate on their vehicle must order before the end of August 2018. “The specialty license plate program allows drivers to give their plates a more personal touch. 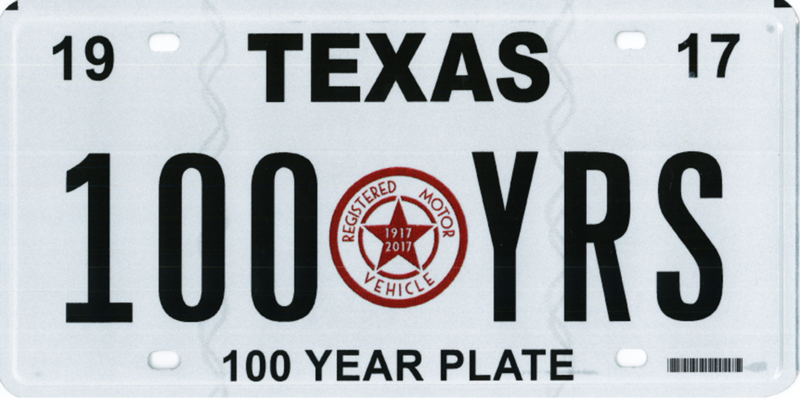 Plate enthusiasts, collectors, historians and everyday Texans can commemorate this 100-year milestone by displaying a piece of plate history,” said TxDMV Executive Director Whitney Brewster.